Download "Multiple Subject Internship Credential Single Subject Internship Credential Education Specialist Internship Credential"
1 INTERNSHIP CONTRACT AGREEMENT by and between BRANDMAN UNIVERSITY and SANTA BARBARA UNIFIED SCHOOL DISTRICT Multiple Subject Internship Credential Single Subject Internship Credential Education Specialist Internship Credential An Internship Credential authorizes the same service at the same level as the Preliminary Credential with some exceptions. The Internship Credential is only valid in one school district or consortium under the preconditions established by State law (see Appendix A). For this reason, interns must have a contract before a credential can be issued. Each intern candidate is to work under the direct and continuing supervision of a Brandman University Supervisor, from the Santa Maria Campus, and District Mentor who provides general support at the classroom level of the cooperating school. Also, the Internship Credential shall be issued initially for a two-year period and may be renewed by the Commission. (Education Code Section 44455). For renewals, please see Education Code Section I. General Provisions a. The UNIVERSITY agrees and verifies that: i. 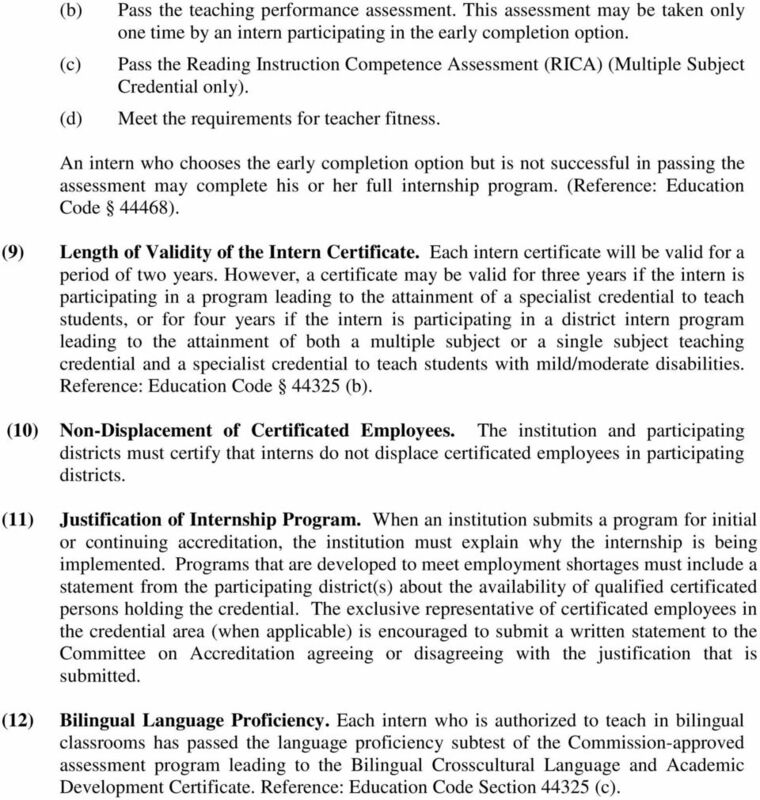 Each Intern Teacher shall have met the requirements for enrollment in its Credential Programs ii. Each Intern Teacher must have completed the minimum number of preservice hours of University Credential Program course work, as required by the CCTC for issuance of the Intern Credential. iii. 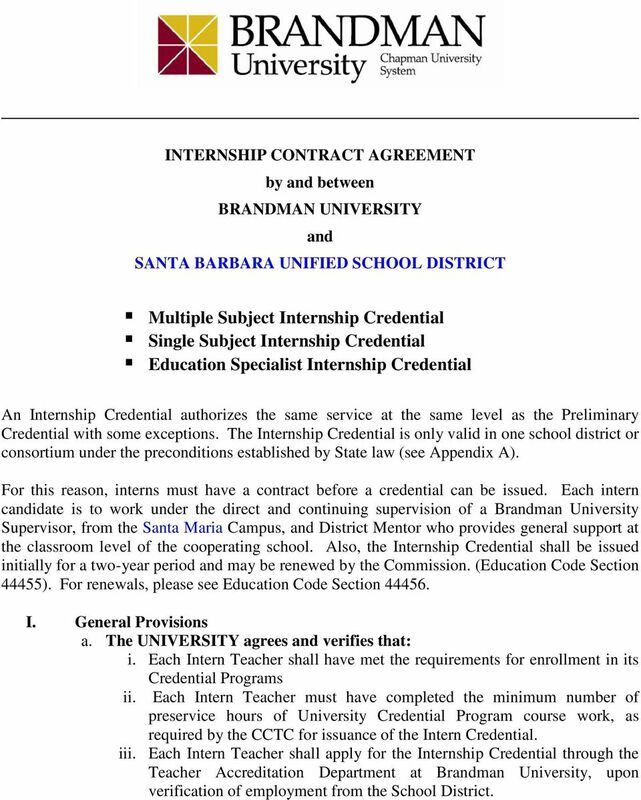 Each Intern Teacher shall apply for the Internship Credential through the Teacher Accreditation Department at Brandman University, upon verification of employment from the School District. 3 standards, frameworks, and accountability systems that drive the curriculum of public schools. ii. The UNIVERSITY shall provide supervision and ongoing support for a minimum of 72 hours per school year. University supervisors will conduct classroom observations a minimum of four times each term that include pre and post observation discussions. Supervisors will maintain weekly contact with the intern to provide support related to planning, curriculum, and instruction in addition to problem solving regarding students. iii. 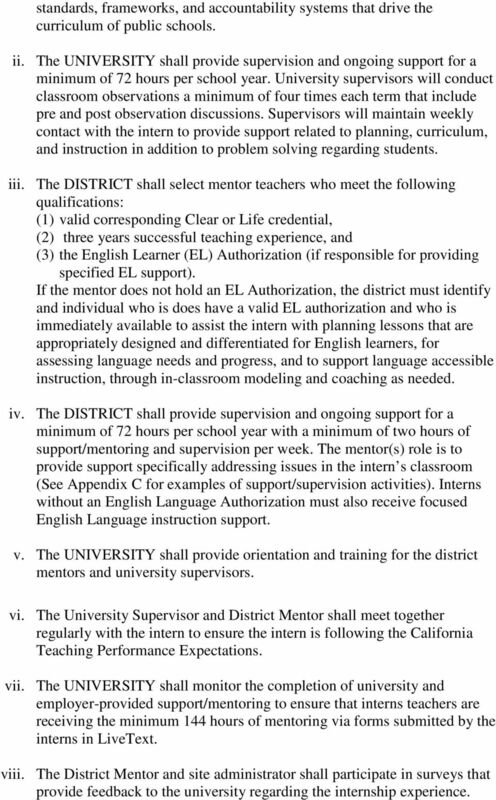 The DISTRICT shall select mentor teachers who meet the following qualifications: (1) valid corresponding Clear or Life credential, (2) three years successful teaching experience, and (3) the English Learner (EL) Authorization (if responsible for providing specified EL support). If the mentor does not hold an EL Authorization, the district must identify and individual who is does have a valid EL authorization and who is immediately available to assist the intern with planning lessons that are appropriately designed and differentiated for English learners, for assessing language needs and progress, and to support language accessible instruction, through in-classroom modeling and coaching as needed. iv. The DISTRICT shall provide supervision and ongoing support for a minimum of 72 hours per school year with a minimum of two hours of support/mentoring and supervision per week. 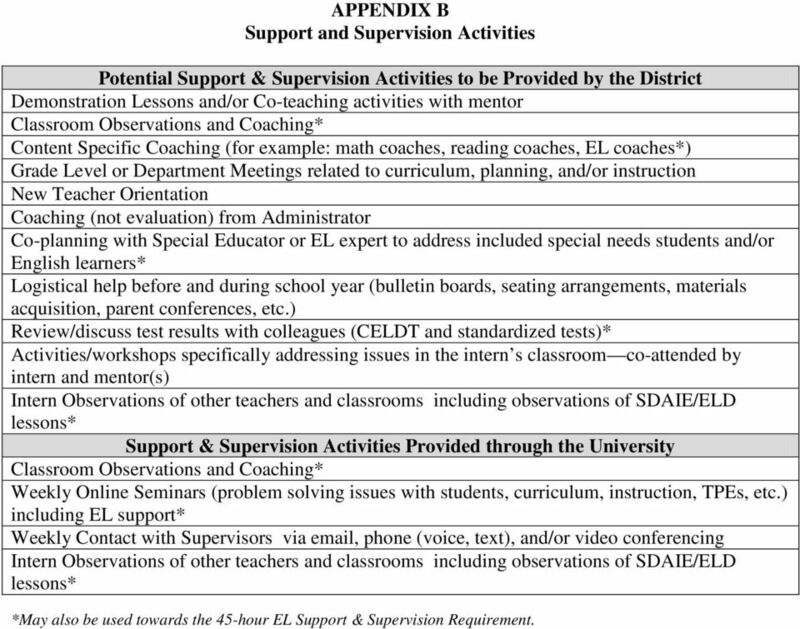 The mentor(s) role is to provide support specifically addressing issues in the intern s classroom (See Appendix C for examples of support/supervision activities). 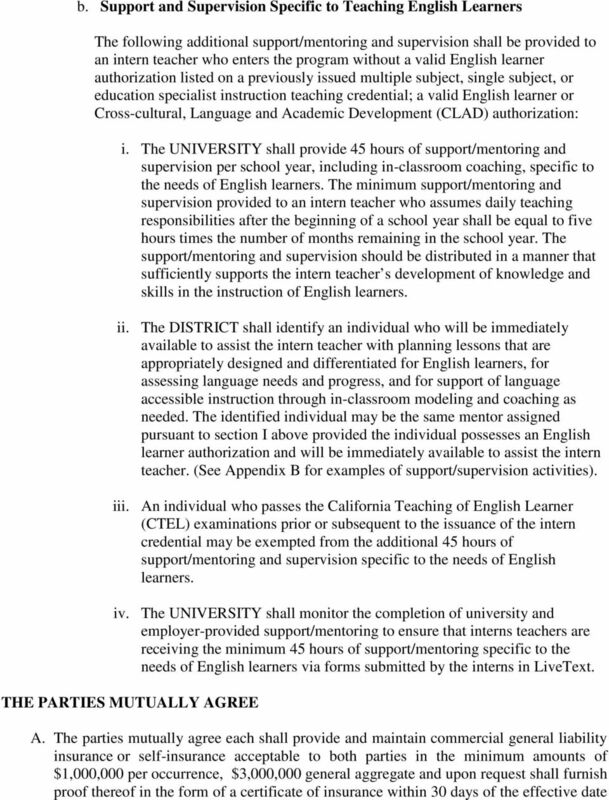 Interns without an English Language Authorization must also receive focused English Language instruction support. v. The UNIVERSITY shall provide orientation and training for the district mentors and university supervisors. vi. 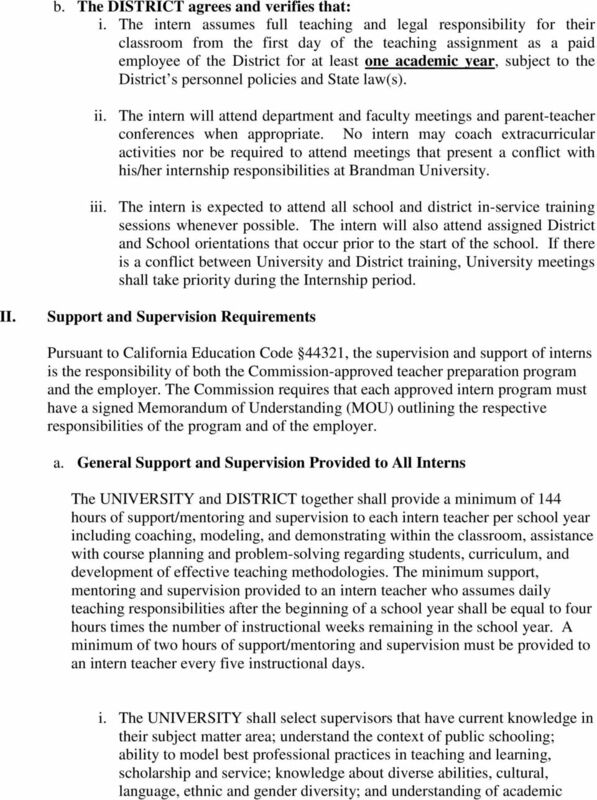 The University Supervisor and District Mentor shall meet together regularly with the intern to ensure the intern is following the California Teaching Performance Expectations. vii. The UNIVERSITY shall monitor the completion of university and employer-provided support/mentoring to ensure that interns teachers are receiving the minimum 144 hours of mentoring via forms submitted by the interns in LiveText. viii. The District Mentor and site administrator shall participate in surveys that provide feedback to the university regarding the internship experience. 6 F. If any term or provision of this Agreement is for any reason held to be invalid, such invalidity shall not affect any other term or provision, and this Agreement shall be interpreted as if such term or provision had never been contained in this Agreement. 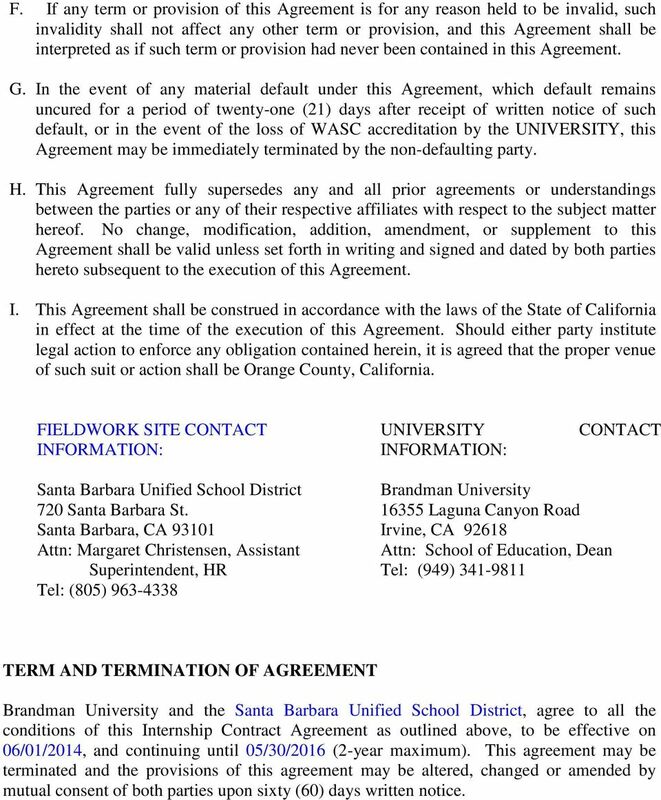 G. In the event of any material default under this Agreement, which default remains uncured for a period of twenty-one (21) days after receipt of written notice of such default, or in the event of the loss of WASC accreditation by the UNIVERSITY, this Agreement may be immediately terminated by the non-defaulting party. 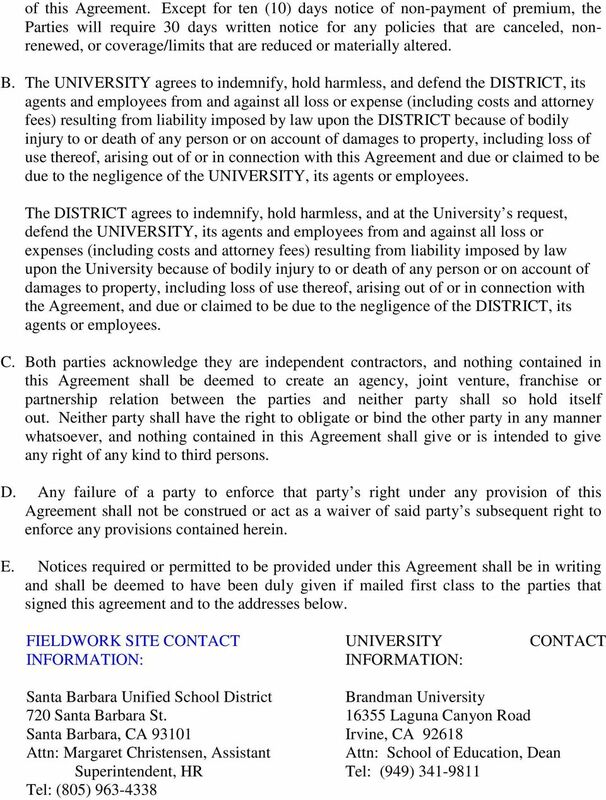 H. This Agreement fully supersedes any and all prior agreements or understandings between the parties or any of their respective affiliates with respect to the subject matter hereof. No change, modification, addition, amendment, or supplement to this Agreement shall be valid unless set forth in writing and signed and dated by both parties hereto subsequent to the execution of this Agreement. I. This Agreement shall be construed in accordance with the laws of the State of California in effect at the time of the execution of this Agreement. Should either party institute legal action to enforce any obligation contained herein, it is agreed that the proper venue of such suit or action shall be Orange County, California. FIELDWORK SITE CONTACT INFORMATION: UNIVERSITY INFORMATION: CONTACT Santa Barbara Unified School District 720 Santa Barbara St. Santa Barbara, CA Attn: Margaret Christensen, Assistant Superintendent, HR Tel: (805) Brandman University Laguna Canyon Road Irvine, CA Attn: School of Education, Dean Tel: (949) TERM AND TERMINATION OF AGREEMENT Brandman University and the Santa Barbara Unified School District, agree to all the conditions of this Internship Contract Agreement as outlined above, to be effective on 06/01/2014, and continuing until 05/30/2016 (2-year maximum). This agreement may be terminated and the provisions of this agreement may be altered, changed or amended by mutual consent of both parties upon sixty (60) days written notice. 8 APPENDIX A Preconditions Established for Internship Programs For initial program accreditation and continuing accreditation by the Committee on Accreditation, participating districts and universities must adhere to the following requirements of state law or Commission policy. (1) Bachelor's Degree Requirement. Candidates admitted to internship programs must hold baccalaureate degrees or higher from a regionally accredited institution of higher education. Reference: Education Code 44325, 44326, (2) Subject Matter Requirement. Each Multiple Subject intern admitted into the program has passed the Commission-approved subject matter examinations(s) for the subject area(s) in which the Intern is authorized to teach, and each Single Subject intern admitted into the program has passed the Commission-approved subject matter examination(s) or completed the subject matter program for the subject areas(s) in which the Intern is authorized to teach. Reference: Education Code 44325(c) (3). (3) Pre-Service Requirement. (a) Each Multiple and Single Subject Internship program must includes a minimum of 120 clock hour (or the semester or quarter unit equivalent) pre-service component which includes foundational preparation in general pedagogy including classroom management and planning, reading/language arts, subject specific pedagogy, human development, and teaching English Learners. 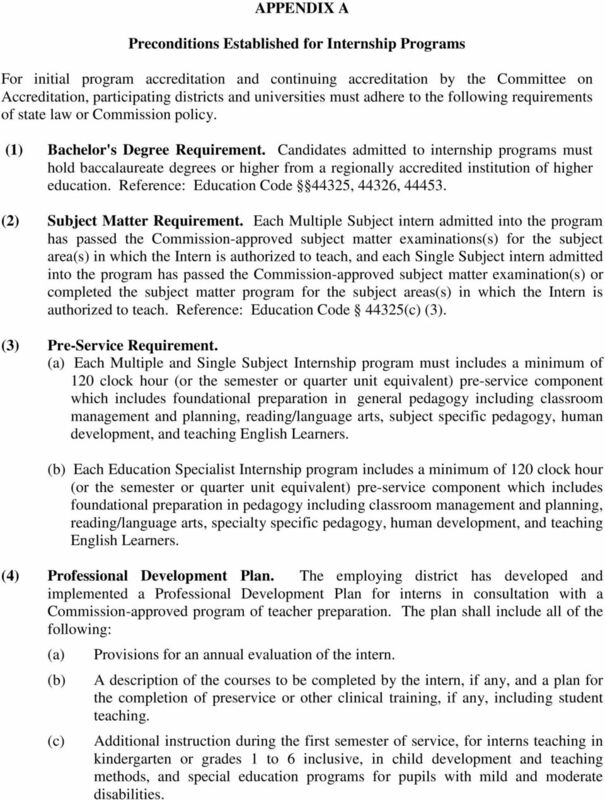 (b) Each Education Specialist Internship program includes a minimum of 120 clock hour (or the semester or quarter unit equivalent) pre-service component which includes foundational preparation in pedagogy including classroom management and planning, reading/language arts, specialty specific pedagogy, human development, and teaching English Learners. (4) Professional Development Plan. 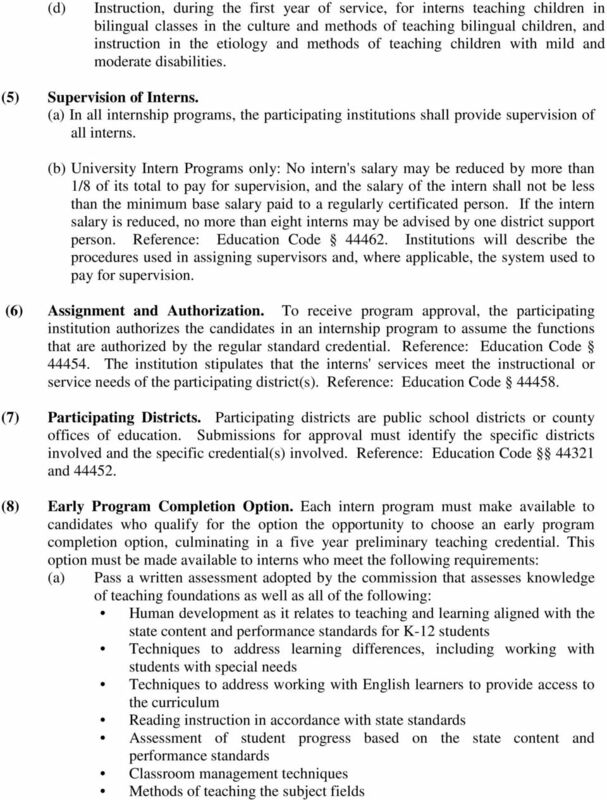 The employing district has developed and implemented a Professional Development Plan for interns in consultation with a Commission-approved program of teacher preparation. The plan shall include all of the following: (a) (b) (c) Provisions for an annual evaluation of the intern. A description of the courses to be completed by the intern, if any, and a plan for the completion of preservice or other clinical training, if any, including student teaching. Additional instruction during the first semester of service, for interns teaching in kindergarten or grades 1 to 6 inclusive, in child development and teaching methods, and special education programs for pupils with mild and moderate disabilities. 10 (b) (c) (d) Pass the teaching performance assessment. This assessment may be taken only one time by an intern participating in the early completion option. Pass the Reading Instruction Competence Assessment (RICA) (Multiple Subject Credential only). Meet the requirements for teacher fitness. An intern who chooses the early completion option but is not successful in passing the assessment may complete his or her full internship program. (Reference: Education Code 44468). (9) Length of Validity of the Intern Certificate. Each intern certificate will be valid for a period of two years. However, a certificate may be valid for three years if the intern is participating in a program leading to the attainment of a specialist credential to teach students, or for four years if the intern is participating in a district intern program leading to the attainment of both a multiple subject or a single subject teaching credential and a specialist credential to teach students with mild/moderate disabilities. Reference: Education Code (b). (10) Non-Displacement of Certificated Employees. The institution and participating districts must certify that interns do not displace certificated employees in participating districts. (11) Justification of Internship Program. When an institution submits a program for initial or continuing accreditation, the institution must explain why the internship is being implemented. Programs that are developed to meet employment shortages must include a statement from the participating district(s) about the availability of qualified certificated persons holding the credential. The exclusive representative of certificated employees in the credential area (when applicable) is encouraged to submit a written statement to the Committee on Accreditation agreeing or disagreeing with the justification that is submitted. (12) Bilingual Language Proficiency. Each intern who is authorized to teach in bilingual classrooms has passed the language proficiency subtest of the Commission-approved assessment program leading to the Bilingual Crosscultural Language and Academic Development Certificate. Reference: Education Code Section (c). 11 APPENDIX B Support and Supervision Activities Potential Support & Supervision Activities to be Provided by the District Demonstration Lessons and/or Co-teaching activities with mentor Classroom Observations and Coaching* Content Specific Coaching (for example: math coaches, reading coaches, EL coaches*) Grade Level or Department Meetings related to curriculum, planning, and/or instruction New Teacher Orientation Coaching (not evaluation) from Administrator Co-planning with Special Educator or EL expert to address included special needs students and/or English learners* Logistical help before and during school year (bulletin boards, seating arrangements, materials acquisition, parent conferences, etc.) Review/discuss test results with colleagues (CELDT and standardized tests)* Activities/workshops specifically addressing issues in the intern s classroom co-attended by intern and mentor(s) Intern Observations of other teachers and classrooms including observations of SDAIE/ELD lessons* Support & Supervision Activities Provided through the University Classroom Observations and Coaching* Weekly Online Seminars (problem solving issues with students, curriculum, instruction, TPEs, etc.) including EL support* Weekly Contact with Supervisors via , phone (voice, text), and/or video conferencing Intern Observations of other teachers and classrooms including observations of SDAIE/ELD lessons* *May also be used towards the 45-hour EL Support & Supervision Requirement. The TEKR Lexicon. You are applying to be a day-to-day substitute teacher. 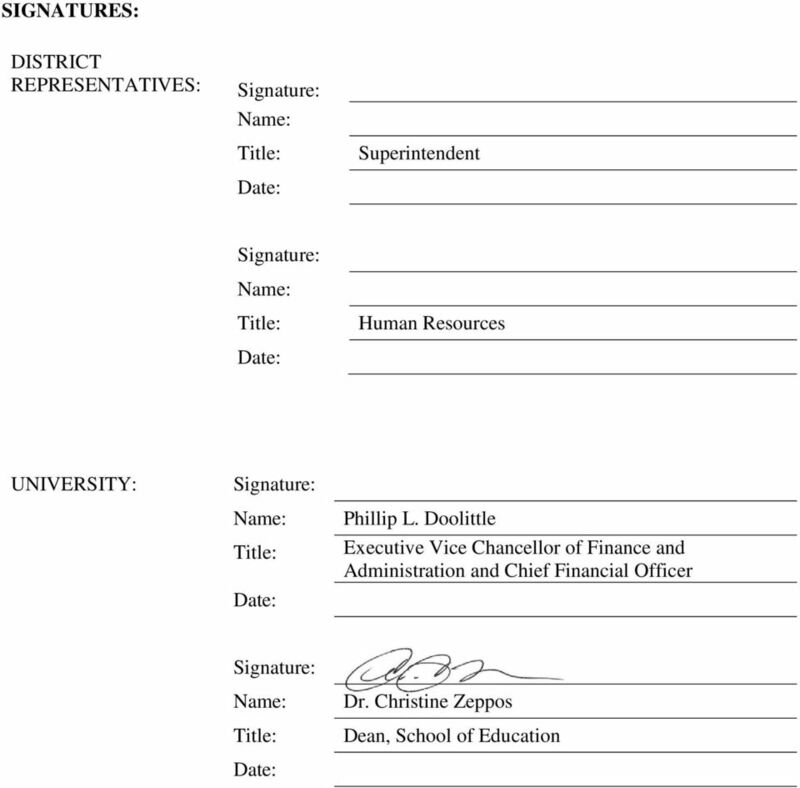 AFFILIATION AGREEMENT PACKET FOR DOCTOR OF NURSING PRACTICE PRACTICUM EXPERIENCE ADMINISTRATION AND ADVANCED PRACTICE NURSING STUDENTS.